Current research is suggesting that a ‘companion’ animal in school can make a difference to the well-being of both staff and pupils. 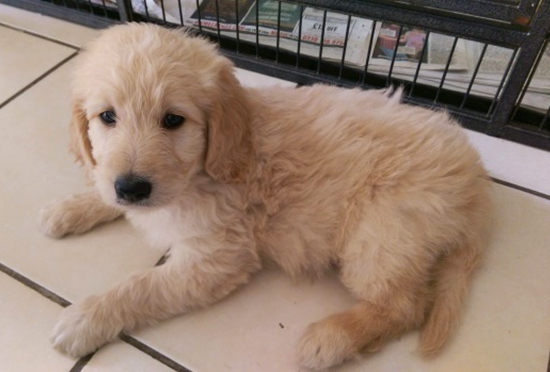 With this in mind, Hallsville Primary School has become the daytime home for Star, a golden doodle dog. In order for Star to be successfully and safely integrated into the life of the school, a risk assessment has been undertaken and is outlined below. The safety of children and Star are paramount. We must also ensure that a dog in school can have as natural a life as possible while in the school building. 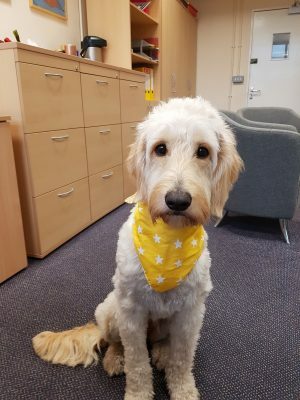 Research into the most appropriate breed indicates that golden doodles are well suited to working and playing with children. A visit was undertaken to the puppy’s home to see how she interacted with the children and family there. The dog is regularly groomed and checked for any infections or illnesses. Visits to the vet take place regularly and she will have all necessary inoculations. Star is wormed every three-six months. Star’s claws are trimmed to reduce the risk of scratching. She has plenty of exercise. She is exercised before working with children. 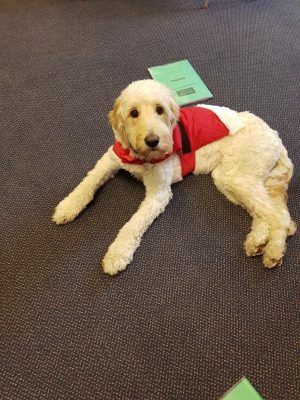 Star has undertaken puppy training classes form a reputable training company. Work is also be undertaken to ensure that children know how to approach dogs and how to behave when dogs are around. Star lives with Ms. Johnson when not at school and she will ensure that Star is healthy and fit to be in school at all times. She is registered with a vet in Essex and is up to date (and will be kept up to date) with immunisations and worming. A record is kept of his immunisations and health checks. We appreciate that not all families and children are comfortable with dogs and will respect parental wishes for any child not to come into direct contact with Star. Please notify the office if this is the case. Star and her owner will be expected to adopt the same cleanliness and policies as all other dogs on the school site. She will be on a lead when with children except in controlled supervised circumstances. She will not be allowed to toilet anywhere on the playground area and any ‘mess’ will be cleaned up and safely disposed of. 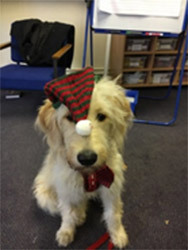 Happy Christmas and a prosperous New Year from Star the Dog. Star really enjoyed dressing up for Friendship Friday during Anti-bullying Week.